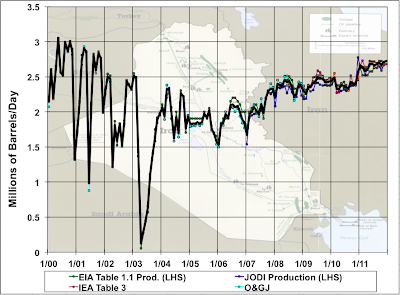 It's been over six months since we checked in on Iraqi oil production. After going to the trouble of updating the spreadsheet this morning with four different data sources, I see why. 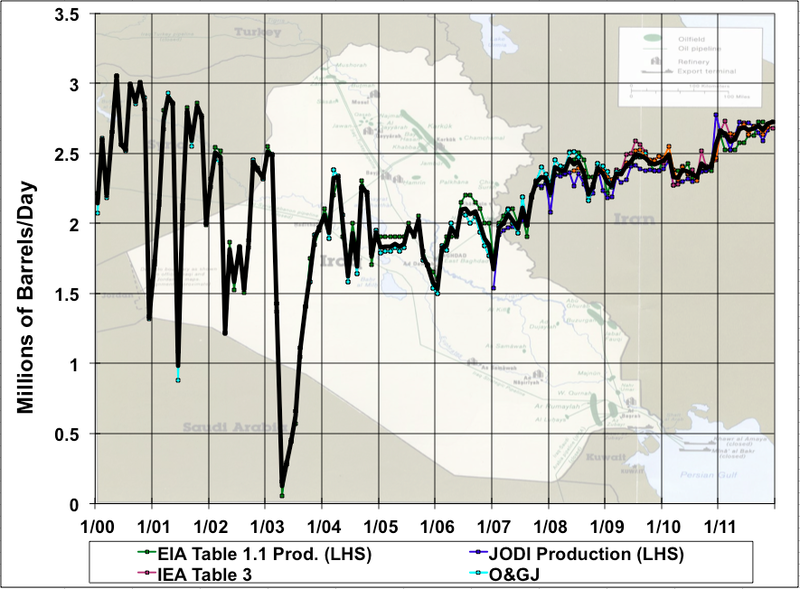 Watching Iraqi oil production grow is like watching paint dry. It is growing, but very, very slowly. At this rate it will take another couple of years just to reach the Saddam-era level. Although production in the modern era is characterized by being much more stable than during the pre-invasion timeframe. It's also striking that all the data sources agree much more tightly than is the case for other OPEC countries - suggesting Iraq is somewhat more transparent and thus it is easier to estimate oil production. It would be interesting to have some visibility into the ongoing budgets of the international oil and gas companies operating in Iraq. I suspect they are afraid of nationalization or civil war, and thus have been holding back on investing substantial amounts of money. If my suspicions are correct, I can imagine that China would be willing to take on substantial risks in return for preferential treatment. Perhaps Iraq will redistribute concessions at some point. 1. Infrastructure and safety - for S-Iraq. Kurdistan is rather safe. 2. The contracts for the large souther oil fields are unattractive. These are so-called Technical Service Contracts. Hence, there is no major effort by the large operators. 3. OPEC quota (must be raised for Iraq). Kurdistan (N-Iraq) also has high potential. However, it looks like that the Central Iraqi Government does not like to support high production from the Kurdish region.